Blouse: Equipment, Skirt: c/o Oasap.com, Booties: Forever 21, Tights: Target, Purse: Forever 21 (clutch version here), Necklace: T.J. Maxx (obsessed with this and this), Lipstick: YSL Glossy Stain in "Rouge Laque"
There are some things that just scream "holiday season" and this tulle skirt is definitely one of them. I knew as soon as I got it that I'd be wearing it to my husband's office Christmas party. It's just the right amount of fancy, but still fun and playful, for an event that's dressy without being too formal. It's definitely a bit of a statement piece, and I had a few moments before stepping out where I felt somewhat unsure, but if there's any time to be a little more over the top than usual, it's a Christmas party! I loved how girly - and maybe even a little flirty! - I felt while wearing it and I can't wait to style it in tons of different ways for some of the other events we have coming up! LOVE that skirt on you and how you kept everything else simple - so cute! I have a very similar skirt from LOFT - love how you styled it up! And gorgeous hair. I have been wanting a tulle skirt ever since I was at a Bar Mitzvah last month and was admiring all of the little girls in their tutus :) You look beautiful, and I love how you styled this outfit! I'm really confused by this outfit... why is your shirt so large and your skirt so short? You look like you're either hiding something under there, or you grabbed your husband's work shirt by mistake. I won't even ask why a parking garage was the best option here. SO CUTE! I love the skirt paired with tights and booties! GORGEOUS! You look so CUTE!!! 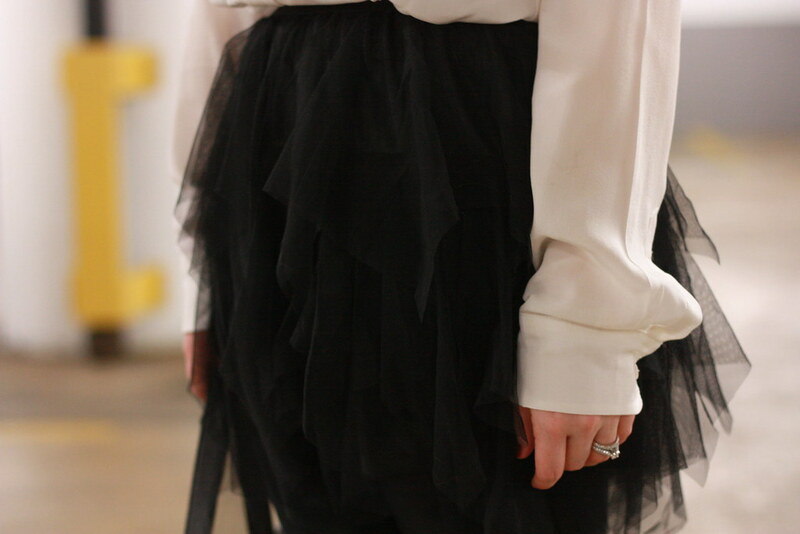 I love that tulle skirt! Love this! You are too cute for words - and of course, the skirt looks amazing!